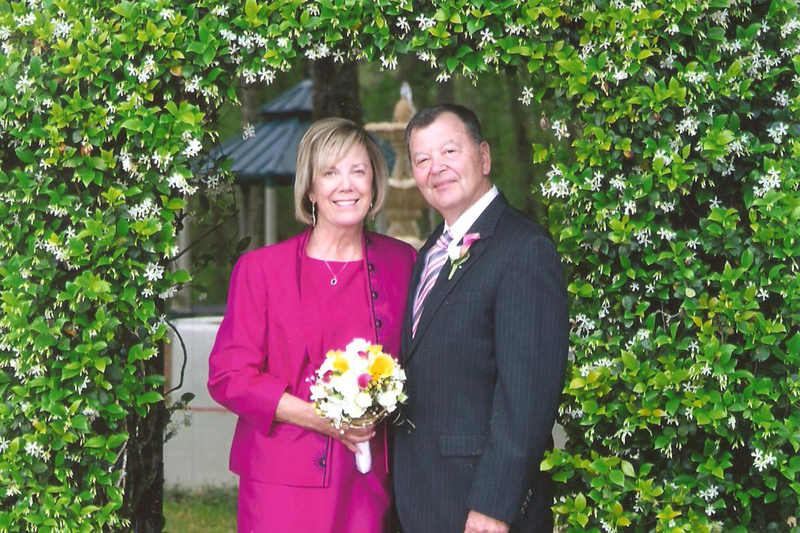 Jay and Bonnie Braden were married 47 years and were blessed with four children and many grandchildren, in lives that took them many places as a result of Jay’s career in the US Army, including two tours in Germany. 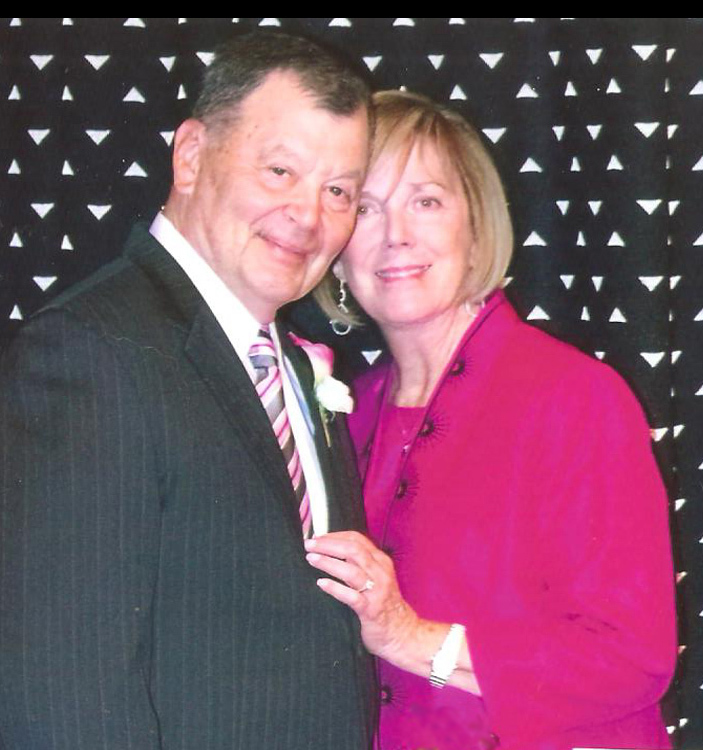 In 1996 Jay retired from the Army and worked another 16 years at two universities before fully retiring to golf, racquetball, and family fun; while Bonnie remained active with family, church, crafts, and tennis, to name a few things. By 2012 they were living in Valrico, fully retired, and looking forward to growing old together. But that was not to be, as Bonnie went to be with our Lord in June of 2014. Fred and Joyce Pollicina were married over 30 years. Joyce had two children and five grandchildren from a previous marriage. 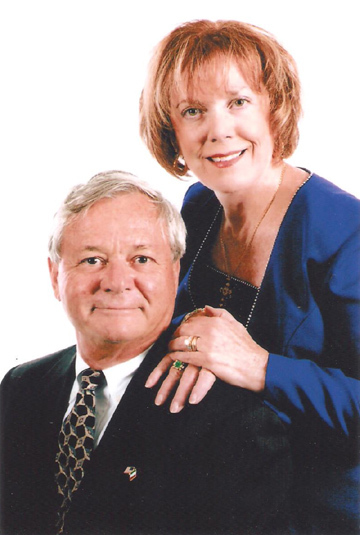 Both Fred and Joyce were healthcare professionals; Fred was a renowned cardiologist and rose to be Chief of Staff at what was then University Community Hospital near the University of South Florida campus, and Joyce was a Critical Care Registered Nurse and ran 3-Main at that facility. 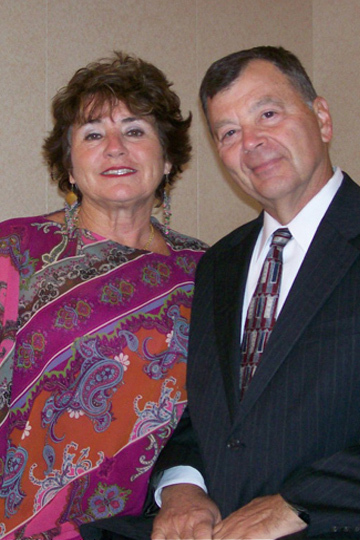 Fred was retired due to medical issues in the late 1990s, and Joyce retired in 2011 after 47 years in nursing. They traveled together and with friends until Fred went to be with our Lord in July of 2015. Jay and Joyce had known each other casually for years. For example, Jay coached Joyce's grandson Conner in soccer, and Jay & Bonnie met Fred & Joyce at times at Moffitt Cancer Center when Bonnie and Fred were both being treated there. Also, Joyce's daughter Michelle had sung at Steve and Sandra's wedding. Over about an 18 month period beginning in November of 2016 they began seeing each other. Although Jay refused to admit it until way past when he should have, he came to love Joyce and the feeling was mutual. Jay came to realize that while Bonnie was the love of his life for 47 years, and that while Fred was the love of Joyce’s life for 30 years, Jay and Joyce could each love other in their own special way. While Jay will never love anyone like he loved Bonnie, and while Joyce will never love anyone like she loved Fred, Jay and Joyce can love each other - deeply. One day they will each be buried with their former spouses and be with them in heaven. For now they will continue to enjoy their time together and their common interests, and hope to do so for a long while. This month was marked with a lot of activity. Joyce got a good offer on our home and was able to close on it. Jay and Joyce travelled to Orlando to meet one day with Robert and his family who were vacationing there. Then Jay and Joyce traveled Monday through Friday to San Francisco and back for all the touristy stuff there: cable car riding, fisherman’s wharf eating and attractions, a bus trip into Sonoma and Napa Valleys for wine tasting, visiting and eating in Chinatown, and taking the ferry to and from Sausalito for lunch and to experience that unique town. February was alaso the month that the Florida Strawberry Festival began in Plan City and Joyce turned in two entries into the horticulture judging. Click here to find out how she did. In January Jay and Joyce continued to work to get their homes sold. They also had the opportunity to spend a few days in Orlando with Karen and her family. 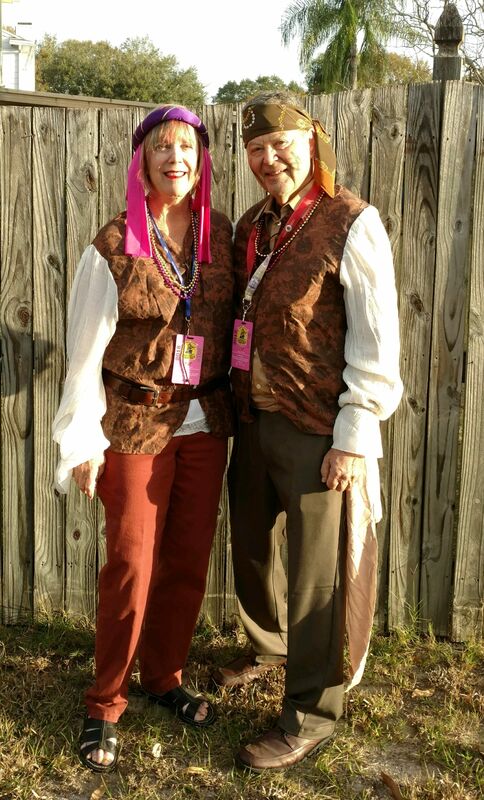 They did some indoor cart racing which was really fun, went to a Pirates Dinner Theater, a lot of fun, and went twice to an Escape Room for two different scenarios. Everything was really fun, especially the experiences inside each Escape Room. In December there was the annual Sunday Schhool Christmas party for Jay’s class and there were good food and games. This was the month that Jay also traveled Pittsburgh to be with his uncle Don who was in the hospital and not doing well. Jay was glad to be able to visit with him and his son David, though Uncle Don passed away within a week of Jay‘s visit. Christmas day was spent with Joyce and her family, and it was hosted by Karrie King, Michael Kernohan‘s fiancé. Again it was good time and fun games. 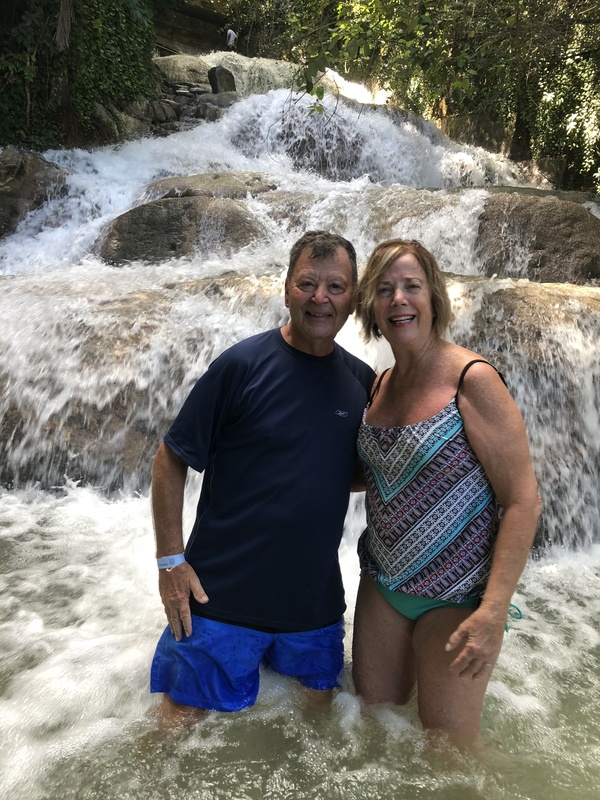 Jay and Joyce flew in to Jamaica on November 4 and spent five nights there at the Jewel Dunn‘s River Falls Resort. Had a super time. Zip-lining. Dunn’s River Falls climbing. The Blue Hole. The Jamaican bobsled run. 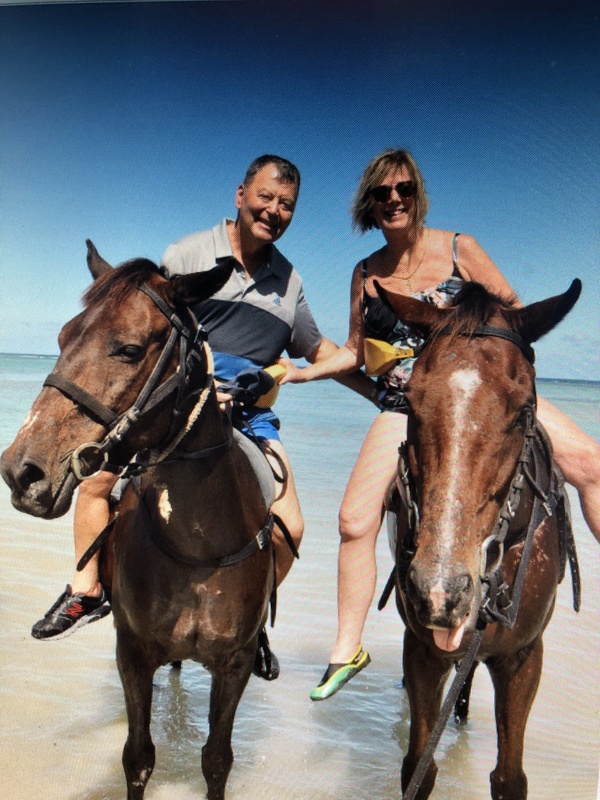 Riding horses in the Caribbean waters. Enjoyed the all inclusive resort where our room was upgraded to ocean front with a magnificent view of the property in the Caribbean. Also had a very nice Thanksgiving dinner with Joyce’s children including Michael and his fiancée and Michelle and her family. For the dinner, the grocery store made a small error in the order which set our eating time back an hour, but the store made up for it by giving us a cheese tray and a spinach dip tray ... and this gave Jay and Joyce time to play some parlor games, which were fun. Among some of the activities of this month was driving up to Gatlinburg for about four days to enjoy the Great Smoky Mountains to include Cades Cove, hiking to Laurel Falls, riding the lift up to the Gatlinburg overview, enjoying all types of Gatlinburg cuisine, and sampling the local moonshine. Our friend Lu Thompson joined us for this fun time. 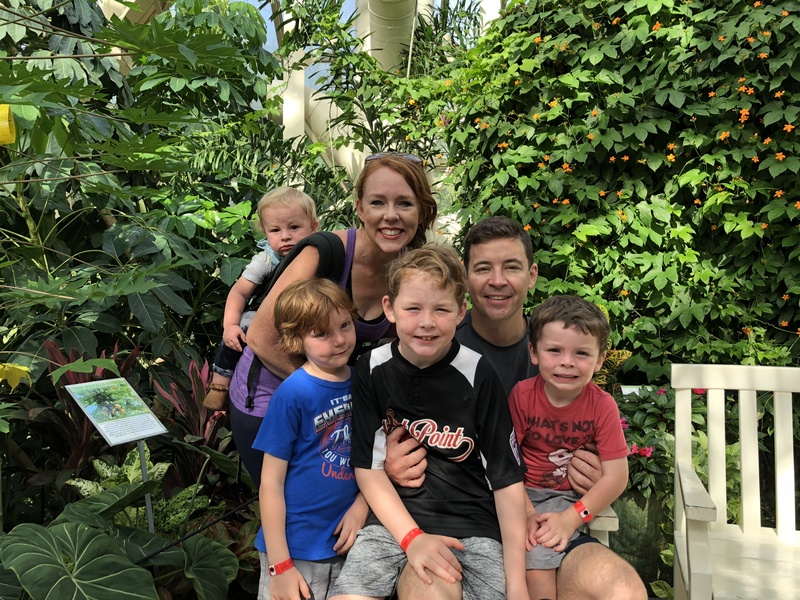 The month started with a super great visit up to be with Robert and his family as we enjoyed ourselves at Callaway Gardens to include zip lining, swimming, the aqua park, the antique car show, the balloon fest, miniature golf, and other good family fun. 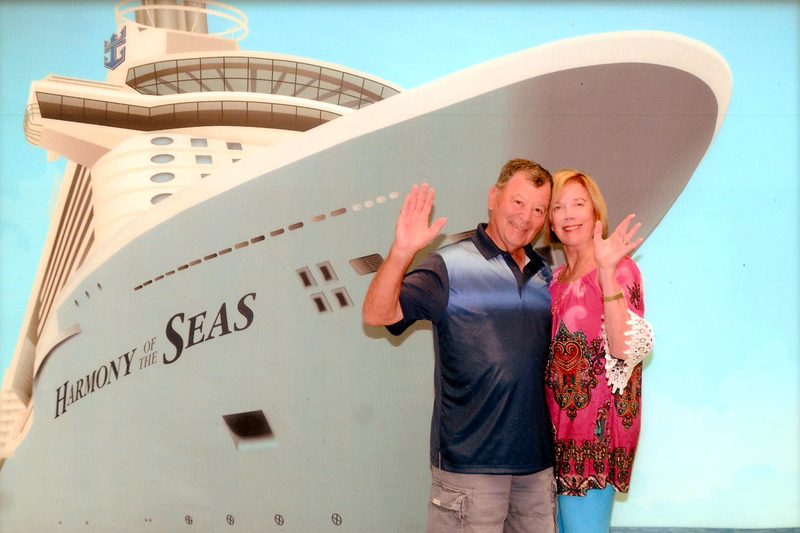 Jay and Joyce also took a seven day cruise in the Eastern Caribbean on the Royal Caribbean ship Harmony of the Seas. We visited Nassau, St. Thomas, and Saint Martin, and had a lot of fun or on the way. This included some very good snorkeling, a couple of great beach days, and an excursion around St Martin for water fun. Of course, the shipboard activities and dining were just great, also. This was a big month for Savanah – and her family, of course. Savanah began college at Southeastern University in Lakeland. She is rooming withy a softball friend from her high school. The beginning of the month found Jay and Joyce moving into the home they are renting. The house is in a nice neighborhood, a small community of about 35 homes. Jay and Joyce decided that, for now, they will go with a house perhaps larger than they need, and so their current home has a swimming pool and four bedrooms. No, moving is not fun. They did get a couple of days at Disney for fun at E3pcot and few days in Orlando to be there for a close friend having a kidney transplant. The large event for Anne and Rusty was the birth of their third child: Carson James, born on the 31st. Sandra, Sydney, and Savanah were there to help out. Most of this moth was taken up getting ready to move, though there were a few day of Orlando theme part fun. May was still house hunting. Eventually Jay and Joyce settled on a nice rental property in Brandon, just eight minutes from Jay’s Sablewood Drive home and five minutes from the home of Joyce’s daughter Michelle. Both Jay and Joyce began pre-move activities of deciding what to move and - especially in Jay’s case - what to dispose of ... a hard process, both emotionally and physically. But with all this they managed to work in a couple of trips to Disney, one to Animal Kingdom with Robert and his family. Also, Savanah graduated from Seffner Christian Academy on May 25th - Congratulations!!! 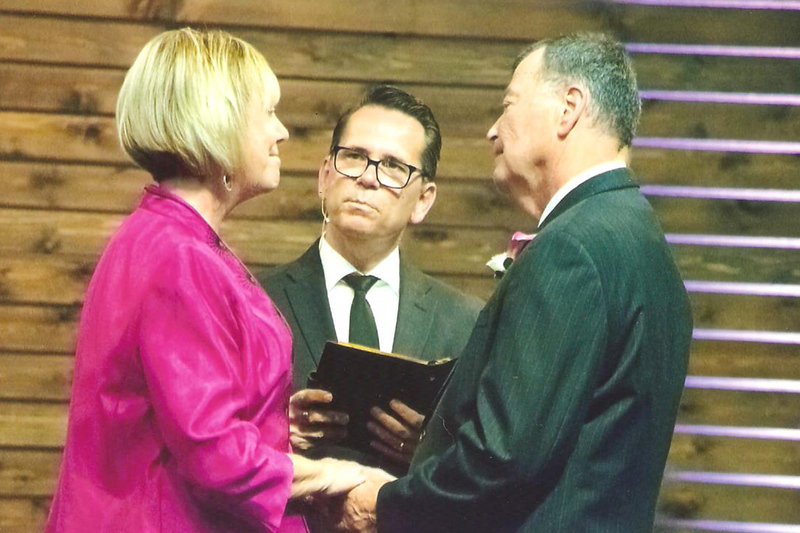 Jay and Joyce were married Saturday, April 7, at Fellowship Baptist Church near Thonotosassa, about 12 miles north of Brandon ... Joyce’s home church. Afterwards there was a reception at The Shrimp Boat Restaurant in Brandon. Jay and Joyce spent their wedding night at the Bilmar on St Pete Beach and departed Monday for Cancun, where they stayed at the Omni Resort and enjoyed the beach, the hotel amenities, and some excursions that involved zip lining, ATV riding, and snorkeling. They returned late on a Friday and departed early Saturday for a wedding in Greenville, SC, on Sunday. They did a small tour of the town and enjoyed the wedding, the reception, and a visit to a local park. Following the wedding they drove to Savannah where they stayed in a wonderful B&B and got a chance to tour the city and also visit nearby Tybee Island. The month ended with a second honeymoon trip, this one to Club Med Sandpiper at Port St Lucie, FL. There they enjoyed the resort and its many activities including a tennis lesson, a golf lesson, a volleyball lesson, playing miniature golf, sailing where Jay managed to turn the boat over and dump his new bride into the water. There were also nightly shows, swimming, and a side trip to a nearby Atlantic Ocean beach. We visited the Strawberry Festival in Plant City, traveled with Robert’s Family and Sandra’s family to a Spring Training baseball game in Plant City, watched Savanah play varsity softball for Seffner Christian Academy, watched Seth play JV ball for SCA, watched Daylin play rec league soccer, watched Sydney player league softball, and watched Braden play rec league baseball. Whew, that’s a lot of sports. But fun. We also learned that Savanah was accepted into Southeastern University in Lakeland, and that her fall roommate will be a friend from her softball team. Great. Jay and Joyce prepared for their upcoming marriage by pre-marital counseling and house hunting. Had a great visit to New Orleans where Anne and Rusty were excellent hosts in getting us out to a number of the Mardi Grad parades so we could have fun, eat treats, and load up on beads and other trinkets. This was also the month that I proposed to Joyce Pollicina. Joyce and I had been seeing each other for around 18 months and we came to love each other. For Joyce there will never be another Fred and for me there will never be another Bonnie, but we are sure that Fred and Bonnie would want us to be together. Nanny also came in for a visit at the end of the month and we visited Epcot and Circus du Soleil. 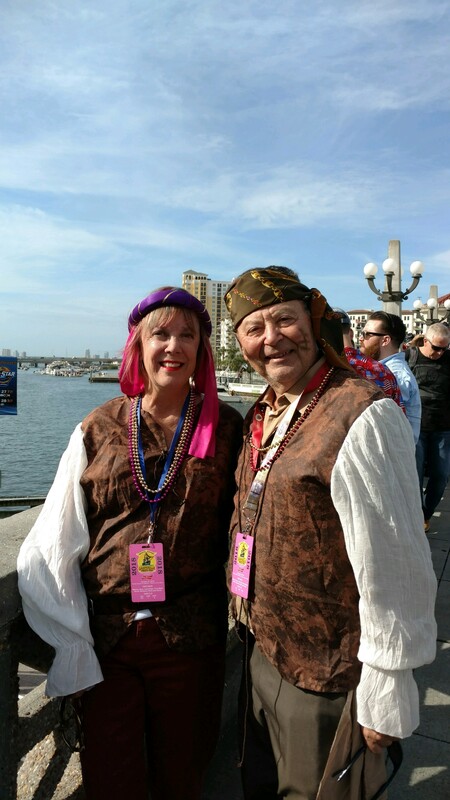 One of the Tampa highlights this month is the Gasparilla Pirate Festival. This includes a large parade and a host of related community events held almost every year since 1904 that celebrate the apocryphal legend of José Gaspar (also known as Gasparilla), a mythical Spanish pirate who supposedly operated in Southwest Florida in the early 1800s. While anyone can find a spot along Bay Shore Drive to watch the parade, there are sections of reserved seating and that is what Jay and Joyce decided to pay for. The money was worth it; no crowds to fight, right up close to the parade, in an excellent position to catch more beads and trinkets that you know what to do with ... and did I mention private porta potties? You wouldn't want to see or - worse - have to use some of the public ones after a day's use. We dressed up and had great fun. It was neat that a lot of people came up to us, evidently thinking that we were part of the parade staff. The highlight of December was in learning that Rusty and Anne are due to have another baby: Due in July 2018. What a blessing!!! This was also the month that Robert graduated from Georgia Tech with his MBA, culminating an 18 month intensive effort that his bank helped him greatly with while Natalie carried a lot of the weekend load with kids, including new baby Luke, as Robert attended classes in Atlanta. Way to go! And we also had a 3-day cruise to the Bahamas right after Christmas. Just think: Most of the USA was enduring freezing temperatures while we were swimming in the Caribbean. A fairly quiet month. Had Thanksgiving dinner with Joyce's daughter Michelle, and her husband Howard, and their son. Sandra and Anne's family travelled to North Carolina for some fun in the mountains, Karens's family visited relatives in Naples, and Robert's family enjoyed the holiday at home with Natalie's family. One of the nice activities in October was being able to meet up at Epcot with Robert and his family as they took some time for Disney fun to celebrate Everett's birthday. Also visited Seaworld with Joyce Pollicina, and had a good day there. Yes, I kept up with my golf and racquetball. The month begin with a very nice Labor Day weekend at Callaway Gardens in Pine Mountain Georgia, where Robert's family, Karen's family, and I stayed in one of their Southern Pine Cottages and enjoyed some of the many activities there such as their Birds of Prey show, their Discovery Center, their Zip Line for kids, swimming at Robin Lake, climbing on the floats in the Aqua Park, and watching the Balloon Fest. Also travelled to Orlando for fun at Discovery Cove - a bit pricy but something everyone has to do at least once. Seaworld runs a first class operation at Discovery Cove. And the tickets for there came with a bonus: tickets for nearby Aquatica and Seaworld, so we tried Aquatica in September also. The month ended with me attending my Lawrence Central High School Class of 1962 reunion in Indianapolis. Wow, my classmates are getting old ... !!!! August was back-to-school month for Daylin, Braden, and Skyler, Karen’s children; for Savanah, Seth, and Sydney, Sandra and Steve’s children; and for Benjamin, Everett, and Charlie, Robert and Natalie’s children. The triplets returned for 5th grade at Chimino Elementary, a very fine school close to their home. Savanah and Seth returned to Seffner Christian Academy for their senior and freshman years, and Sydney began to experience home schooling under the tutelage of Sandra, who took a leave of absence from public school teaching. Benjamin, Everett, and Charlie attend a Montessori School in nearby LaGrange, Georgia. I visited with Robert and Natalie to help celebrate robert’s birthday, and later travelled to New Orleans to be there for Rusty and his Birthday Celebration. Early in ther month Robert and Natalie and family visited, and just after that Rusty and Anne and family visited; and we had fun in each case. In mid-month we enjoyed a stay at Universal's Cabana Bay Resort and played at Volcano Bay, its new water park right next to the resort. One of the events for this month was a trip up to visit Robert and Natalie and their family, and especially to meet their new baby Luke. The visit also included a day trip to Butts Mill Farm, a throwback farm that included games and things for kids to climb one, a petting zoo, miniature golf, and the picnic area. There was also fishing in its pond, and I am pleased to report that everyone did catch a fish. The amazing event of this month was the birth of Luke Collins Braden. PTL!!! It was such a blessing to see their wonderful family grow. May was a traveling month for Rusty and Anne and their children. They drove to Alabama shortly after Luke's birth to be there with Robert and Natalie and share the joys of the latest addition to their family. Then they drove down to Valrico for over a week to visit here with family and friends, and - of course - I just loved it. Then they traveled back to Alabama to be present for one of Rusty's nephews high school graduation before returning to New Orleans. Whew, that's a lot of miles. While they were here, they attended the funeral service for Steve's dad Paul Roberts, who died following a stroke at age 79. Paul was a great husband, father, grandfather, and friend, and he will be missed. April was the month for weddings, with niece Shannon having her wedding reception on Ocracoke Island in North Carolina and with daughter Sara of long time friends Pam and David Duke having her wedding at the Biltmore Estate in Asheville, North Carolina. Two very different venues, but two wonderful locations. Nanny (Mom), Ellen, and I took a Mississippi Riverboat Cruise. We had a great week of cruising and sightseeing that included visits to New Orleans, Natchesz, Vicksburg, and Baton Rougue. Plus we toured three antibellum plantations and the Angola State Prison. The amazing event of this month was the birth of Ryan Kent Zwerner. PTL!!! And the grandkids kept up with school and their activities, such as Sydney's soccer. December began with six fun days. Jay and his mom began with a three day cruise from Port Canaveral to Nassau and back, and then followed that with three nights in Orlando, taking an attractions there a such as the WonderWorks Magic Show, Gatorland, ICE, Disney Springs, Disney's Boardwalk area, and Circus Soleil. In mid December I went up to Pittsburgh to visit with my Uncle Don, my father's younger brother and about the sole remaining relative on that side of my family. He showed me some of the homes of my ancestors, and I took some more notes on his life. 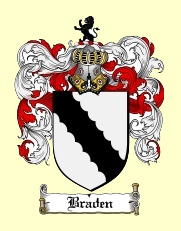 Posted all of that on the Braden clan website, but there is more to do. I probably need to visit him again soon. And, later, during the Christmas holiday, the family got together to again visit Disney Springs and ICE at the Gaylord Palms Resort in Kissimmee, experience trampoline fun at 2Infinity Air Extreme Sports in Lakeland, and just enjoy hanging out together. But too soon after Christmas, after Robert and his family returned to Alabama, and after Rusty and his family returned to New Orleans for his schooling, the Braden household turned quiet for the first time in almost four months. November was a good month. Rusty and Anne continued planning for their return to New Orleans where Rusty will begin his doctoral program at New Orleans Baptist Theological Seminary. Meanwhile, Bonnie Jane kept the Braden household fun and happy. One of the events of the month was taking Bonnie Jane for her first visit to Disney World, where she had a very good time. For Thanksgiving, Rusty and Anne cooked their first turkey dinner, and it was fantastic. Everything came out perfectly. Also, most of the grandkids participated in fall sports activities, so it was also fun watching them compete. In October we had more good news: Robert and Natalie are having another baby! The baby will be due in the May timeframe. Rusty and Anne hosted an ordination party for their friend Brandon Footit, and Robert and family came down for a couple of nghts before Halloween to visit with us. Bell Shoals church also conducted its Trunk or Treat event on the 31st, something that Jay helped out, a large and fun event. September was an exciting month. Rusty and Anne completed their preaching in the town of Walker, Lousiana, and returned to Valrico to stay while Rusty is searching for a new job. Meanwhile Rusty also applied for and was accepted to the doctoral program at New Orleans Baptist Theological Seminary. And we also got word on the gender of their baby; IT'S A BOY!!! Meanwhile, all the grandkids got themselves involved in some type of fall sports activity: baseball, softball, soccer, gymnastics. And Book #2 Delta Dogs was finally done!!! August was back-to-school month for the grandkids, and for Sandra. Benjamin joined his brothers at the Montessori School in nearby LaGrancge, and Savanah and Seth switched schools to Seffner Christian Academy. Sydney continued with gymnastics. Jay continued to play golf and racquetball, and worked on additional editing of Book #2. Robert was admitted to the EMBA Program at Georgia Tech and will be taking classes about every other weekend through December 2017. Robert and Natalie and their family; Steve and Sandra and their family; Nanny; and Jay gathered in Tampa for a cruise on the Carnival Paradise from July 18-23 to Grand Cayman and Cozumel and back. We were missing Rusty and Anne and Bonnie Jane because of concerns over the Zika Virus in Mexico. We also visited LegoLand and did other summer vacation activities. The great news for the month is that Anne and Rusty are expecting a baby!!! Probably in the mid-January time frame. Wonderful blessings! Also, Nanny was here for a few days in June and we traveled up to Orlando to stay overnight at one of the resorts there and take in a performance of the Blue Man Group. Robert and Natalie and family came mid-month and were joined by Steve and Sandra and family for a stay at the Guy Harvey Outpost on St. Pete Beach. Anne came in with Bonnie Jane at the end of the month to do some business involving her condo, so it was great to see her, also. (That's when we got the super news.) Golf and racquetball remained fun, especially as my golf was pretty decent. May was a busy month. Savanah received a late birthday present on May 14 when Sandra and I took her to Discovery Cove. She was surprised, and we all had a fun time. On May 20, I flew up to Robert's house to help Benjamin celebrate his seventh birthday. Rusty and Anne were able to be there for part of the weekend, so that was very nice. Sydney continued with gymnastics, now taking classes twice a week. Seth completed his baseball season and I think he had a good time. But we learned that he may have a medical problem in his right arm and that will need some attention. Sandra got away for a day trip to Universal Orlando and invited me to join them, and that was nice. Over the Memorial Day weekend, the entire Roberts family went to Universal Orlando and that was fun. Golf and racquetball stayed good; I seem to be making some "regular" money at golf. Not a lot, but winning always beats not winning. I did finish Book #2 to the point where I sent it to the printer for a Proof copy. Also made some necessary editing and content corrections to Book #1, and they should both be online very early this month. Not sure if there will be another writing project, but it's possible. A lot of things were going on in April, all of them good. Seth rejoined his baseball team, Sydney began gymnastic lessons, Benjamin started soccer, and Everett began T-ball. Sydney and Savanah participated in Bible Buddies and Bible Drill competition, and Savanah - in her first year - went on to state competition. Also, Sandra and I flew into New Orleans and traveled up to Walker, Louisiana, for Bonnie Jane's first birthday, and that was a very nice time. Stayed busy enough that I did not finish my second round of editing on Book #2 but am determined try to finish it the first week in May. March was a big birthday month. Savanah turned 16!!!! She already has her Learners Permit and it won't be long before she will be driving on her own. Now if Steve and Sandra will just spring for some wheels - nothing new but maybe something like a 2014 Mustang convertible. Went to the State Fair and also to the Strawberry Festival, and made another trip to Universal Orlando with Sandra and family. Spent a few days with Rex Benedict in Melbourne where he gave me a golf lesson and we did some fishing. Played racquetball in the Polk County Senior Games. Also celebrated Nanny's 95th birthday early when Ellen and I joined Mom for a cross Canada train trip from Vancouver to Toronto. Conducted my second round of editing on Book #2 and discovered I still have a lot of work to do. Rec League Youth Baseball started up again for Seth as he joined fellow teammates in a 13-15 Cal Ripkin league. Initially Seth mostly played shortstop and catcher - until his season was put on hold by a broken pinkie finger on his right hand, done playing basketball at school. Charlie and Sydney had birthdays this month; everyone's growing up! The family got together for a weekend at Universal Orlando. A good time and we are already thinking about a return; perhaps after a few new rides come online. Sydney and her partner represented the third grade in her category for the county-wide Science Fair. The team received a superior for its project, the highest level award given. Savanah continued with some tennis lessons. Golf and racquetball are still good, and the book editing is progressing. My goal was to finish editing in February, but the work was more than I thought. Lots of loose ends to tie together, as well as correcting typos and grammatical errors. Weather forecasts for January across the United States included words like “Arctic blasts” and “frigid conditions.” Well, I want to tell our northern friends that we felt it down here in Tampa, also. There were some days where I had to wear a sweater in the mornings until it warmed up into the 70s. This month Charlie joined brother Everett for Montessori schooling, that he is enjoying. Also, Seth turned 14!!! Wow!!! And, thanks to Steve and Sandra I spent one Saturday with them as they drove up to Brooksville, Florida, about 90 minutes away. There we attended the annual Brooksville Raid Civil War reenactment. Seeing the reenactors in their camps and with their equipment and talking to them was very, very interesting. First time I’ve ever done that, and I am a Civil War buff. The day concluded with a mock battle and that was also very interesting. This month Savanah began tennis lessons and Bonnie Jane took her first few steps (pictures coming). I completed the ending of the book; assembled all the (~26) segments into something that will hopefully flow; had it all printed at Office Depot; and am now proofing. About 107,000 words; about 400 pages if it and is published in the standard 6” x 9” book that is common to most libraries. Okay I made it in terms of quantity if not quality.